Big Road Blues Discussion Forums • View topic - rebuild les paul studio?? Re: rebuild les paul studio?? Go over to TheLesPaulForum or MyLesPaulForum. Heaps of information on LP's! check out www.rsguitarworks.net they have premium kits for just about any guitar. GFS sells kits as well as Mojo Tone. I know the guys at RS and they do great work and give good advice. One of their employees does all my setup work for me. I'm hoping he'd teach me how to setup the different kinds of guitars. 57 humbuckers and one of the RS electronic upgrades would put you in a guitar that rivals the sound of the GIbson Custom Shop model. Gibson doesnt put in super high quality electronics in anything they make. Their premium pickups rock with upgraded pots and caps though. I have an Epi Les Paul with 57 classics in it and the RS vintage kit. If you go to mylespaul.com, talk to either TWANG or Jonesy. I've done business with both of them over there and they are great guys. If you want to put '57 Classics in there, you're going to want to get 500k pots. 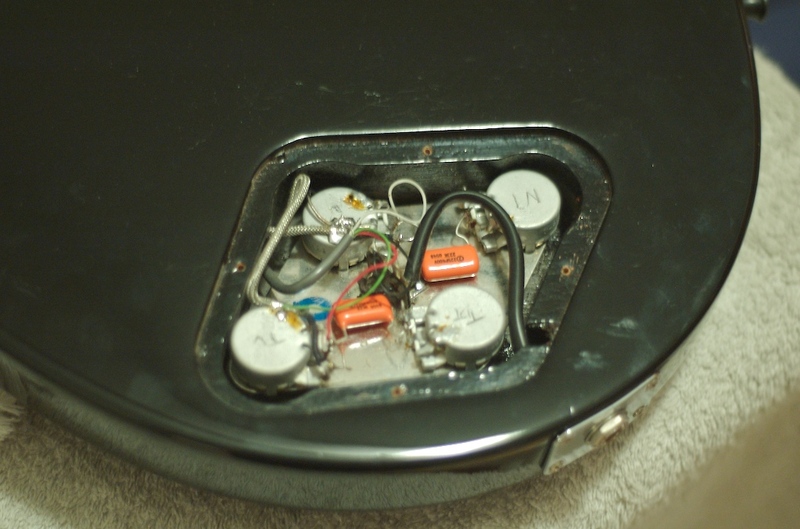 Humbuckers generally go with 500k pots while single coils (except P90s) generally go with 250k pots. As for capacitors, I have paper in oil capacitors in all of my guitars. They sound better than those cheap ceramic caps that most guitars come with, but don't be fooled into thinking that they are gonna make your guitar into a whole new guitar as many people will have you believe. As for switches, Switchcraft jacks and switches are probably the best. Gibson and Fender both use them I believe, and pretty much any repair shop uses them. If you order from RS, I'm fairly certain they will supply you with Switchcraft. If you want to learn to do it yourself, get yourself a good soldering iron and find a diagram. It's pretty self explanatory. Some people have an easy time wiring up guitars, but I don't. I always pay to have it done because my hands shake so it's hard to solder properly. Best of luck and have fun! leftyguitarman, its a older guitar, has a few miles on her. someone has been under the hood fooling with the electrics. the thing is real noisy, and you get string pop when they get touched. something ain't right. yeah , i get that bit about hoping to find "the" sound etc. however, i'm looking to clean it up, and maybe reduce the bass response down just a bit. someone recommened seth lover sh55"s i listened to their web site audio, couldn't tell the difference in any of their pups, they all sound the same. they sound nice , just not alot of difference in between. if you have any recommendations , go for it it, would be appreciated. hey thanks for taking your time to respond . The reason it's popping is because there is a ground issue somewhere. Probably a loose wire or a cold solder joint. What kind of pots are in there? Are the capacitors just little round or square plastic looking capacitors? If so, it wouldn't hurt to swap them out. As for pickups, I'm not too knowledgeable on humbuckers. I've used WB pickups, which are the finest I have ever heard and played, but they also cost quite a bit. In my Epi LP I swapped out the stock pickups for a set of Gibson 496R 500T pickups and they sounded like garbage. Way too high output and just thin sounding. I sold them on ebay and picked up a set of no name Japanese humbuckers from an 80's Greco from a fellow lefty here in Phoenix. They are very low output (7.65 in the bridge and 7.73 in the neck) and they sing. I have no idea what brand they are, what magnets are in them or anything, but they produce a very smooth and round tone. I really like them. If the bass is too much, you may want to try a different value capacitor. Try a 0.015µF capacitor in the neck position and a 0.022µF in the bridge. It won't really lower the bass response, but it will allow the treble to shine through a little bit more, possibly offsetting the bass. Right now I have a 0.022µF in the neck and a 0.047µF in the bridge. The 0.047µF is a little too "dark" sounding for me, so I may swap it out with a 0.035µF if I can. Check to see that all of the wires are properly connected/soldered. Can you take pictures of the inside of the cavity? That might help. If when you touch the strings it pops, it is problably a bad ground to the bridge or tailpiece. I am not sure about Gibsons but their should be a wire going from the pots to the bridge/tailpiece thru the body. If you have an ohm meter check cont. from one to the other. leftyg, got the photo on my desktop, can't get it to the email/website etc. wife , is working late, maybe tomorow. did check the pots, they are between a nickel, and a quarter in size, only the tone pots have legible numbers. the volume pots have gobs of soldier on the tops/numbers. looks like the soldier is holding down the pups wiring/shielded cable. two little capacitors, small salmon colored 1/4 diameter, #'s 225Z5 pots; tone #'s 440-71079A, R1379-440. the volume pot #'s what i can read are as follows,R137938. have nothing else for now. don't know if this helps . will try the photo thing later. rdeeno wrote: If when you touch the strings it pops, it is problably a bad ground to the bridge or tailpiece. I am not sure about Gibsons but their should be a wire going from the pots to the bridge/tailpiece thru the body. If you have an ohm meter check cont. from one to the other. Yeah, you can see it in this picture. Upper left of the control cavity, bare nickel wire to the right of the braided wire.